..so they dance! : Aasha; another victim of the half-and-half syndrome. Aasha; another victim of the half-and-half syndrome. Hai bhagwan, what a cruel title to this review. 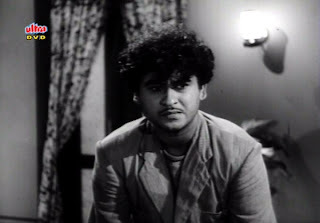 The fact of the matter is that the 1957 film Aasha, starring Vyjayanthimala, Kishore Kumar and Pran, is not the most dramatic case of a Hindi film where one half is splendid and the other not so much. It's actually quite far from it. In this case, I think a lot could be attributed to a change of mood - when I began watching, I was so much on board with this film. Somewhere around the middle I had to pause it and put it away for a while, and when I returned to it, I still liked it, but wasn't feeling the magic anymore. Such is life, I guess. I own this one on DVD now, so I might as well save it for later rewatches, hoping that will sway my opinion into a more positive direction. 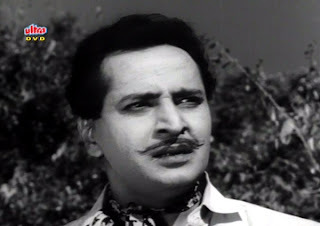 Kishore plays Kishore, whose brother - okay, cousin - Raj (my first film seeing Pran as a younger man! awesome!) is not a very nice guy. 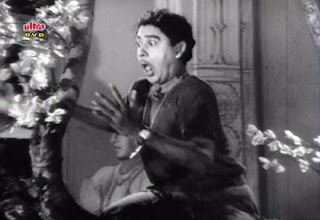 He aspires to marry the rich girl Nirmala (my first film seeing Vyjayanthimala, yay! ), who Kishore falls in love with. But as Raj is not a very nice guy, he has deceived a girl called Kamini, who he dated under the alias of Kishore and then dumped her. Kamini's father begs Raj to marry Kamini to make her a decent girl (or something), which he refuses to do (grr! so evil!) and instead kills the father and frames Kishore for the murder. Boo! Hiss! But isn't Pran great? He's like good wine; even if not too aged, you will still get joyfully drunk! Kishore is as Kishore does; a singing comedic sensation that is fully convincing in the more emotional scenes. It's just good stuff. ..even cutely comical! It was delightful finally seeing her in a film after hearing so much about her, and even though I watch 50's and 60's films only once in a blue moon, I will try to make the effort to see her movies in the future. 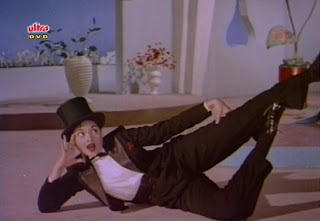 You've probably noticed by now, the film has song scenes in color, while otherwise it's black-and-white. The blend is not jarring for me; I've seen Mughal-e-Azam in similar shape many times, and it's not really an issue. In fact, it serves as a nice reminder of the two different visuals, how much colors contribute to a scene, but how well you can do without them! 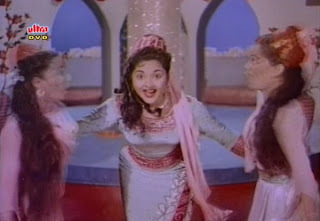 You may wonder, why did I see this film, instead of so many other films (of Vyjayanthimala or otherwise)? "Iina meena deeka", of course. This wonderful song has been a long-time oldie song favourite of mine and I just had to see the film it was attached to. 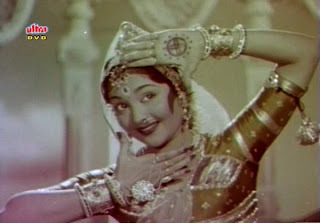 The version I knew was the picturization above; Vyjayanthimala crossdressing and then dancing in an elaborate set. Later in the movie, we get Kishore's lovely male version of the song. Was it worth it? Yes! I really enjoyed the picturization. It's nice to have context for your favourite tunes, even if the context is not mind-blowingly amazing but more of the cute variety. What's the problem, then? It's hard to say. 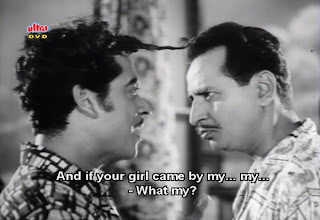 The plot starts off smoothly, there's lots of funny comedy, great Pran-Kishore interaction and beginnings of a wonderful romantic storyline.. But sometime after the midway mark, the movie kind of gets stuck. Things still happen, mind you, but the plot seems to be doing a few circles to take up time until we get to the better, fantastically dramatic finale that is in all accounts, an epic bunch of events. Since I watched the film in two halves, it seemed probably like the film just lost it when I sat down to return to it. Maybe that viewpoint sort of skewers my view; the greatness of the beginning is not so fresh in my mind anymore. Regardless, I wouldn't advice against seeing it. 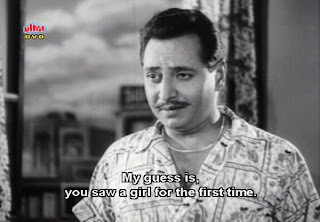 Kishore has done better films, as has Vyjayanthimala, I'm sure (though not sure what those films may be!) so there might be better introduction films to these stars, but for existing fans, or just fans of "Eena meena deeka", give it a spin. Why not? 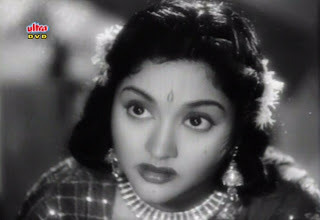 Veracious, I was surprised to see this was your first Vyjayanthimala film; for some reason, I thought you'd seen Jewel Thief. Anyhoo, I've been sidetracked from my Vyjaya fandom lately--with a stack of unwatched DVDs taunting me--but some of my favorites so far have been Jewel Thief, Amrapali, New Delhi (another uneven but cute film with Kishore), and Hatey Bazarey (a Bengali social drama with Ashok Kumar). I'm so glad you linked to Eena Mena Deeka...I seem to only hear that song in other movies (the restaurant scene in Dil Chahta Hai and as a background remixed track in Bluffmaster). Good to finally see the original(s)! Your opinions on this seem about right to me... I agree that the hit song is great, the movie is uneven. The best film with Vyjayanthimala in it - among those I've seen - is Naya Daur. But I think Kath Putli has more fantastic dancing, and it's probably my personal favorite. 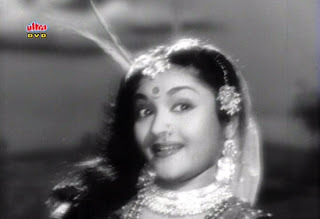 Vyjayanthimala did some great dancing and acting in Sadhna. 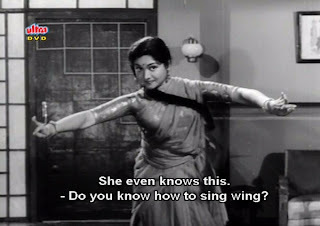 I'd also recommend anything with both Vyjayanthimala and Padmini (who is my favorite dancer-actress of all time)... They do the best dance competition of all time in the Tamil film Vanjikottai Valiban. They're also together in Amar Deep, which puts them in a sort of triangle with Dev Anand. All the ones I just mentioned came out in 1957 or '58. There are a few earlier, uneven ones but with very good music - Bahar (her first Hindi movie - made in 1951, when she was 15) and Nagin (1954). And yes, New Delhi (which came out in '56) is another one that is uneven but still pretty good.